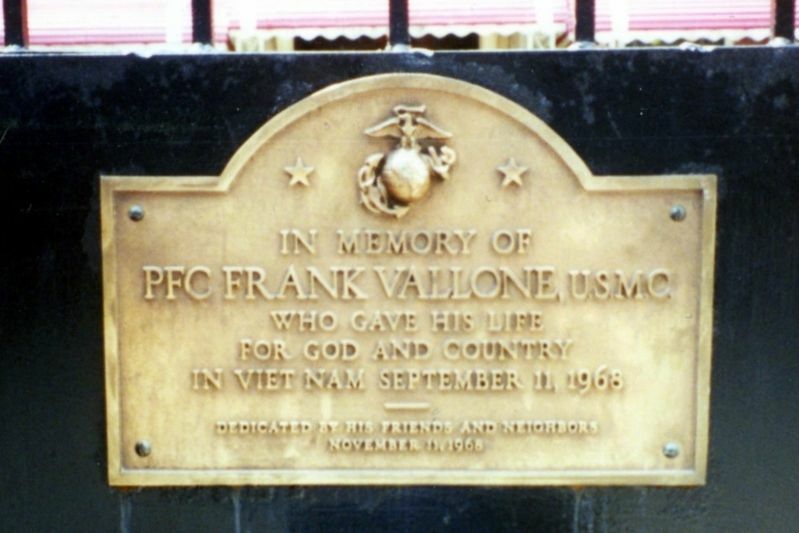 PFC Frank Vallone, USMC. —. Erected 1968 by his friends and neighbors. Location. 40° 43.048′ N, 73° 59.91′ W. Marker is in New York, New York, in New York County. Marker can be reached from Mulberry Street near Canal Street, on the right when traveling north. Touch for map. 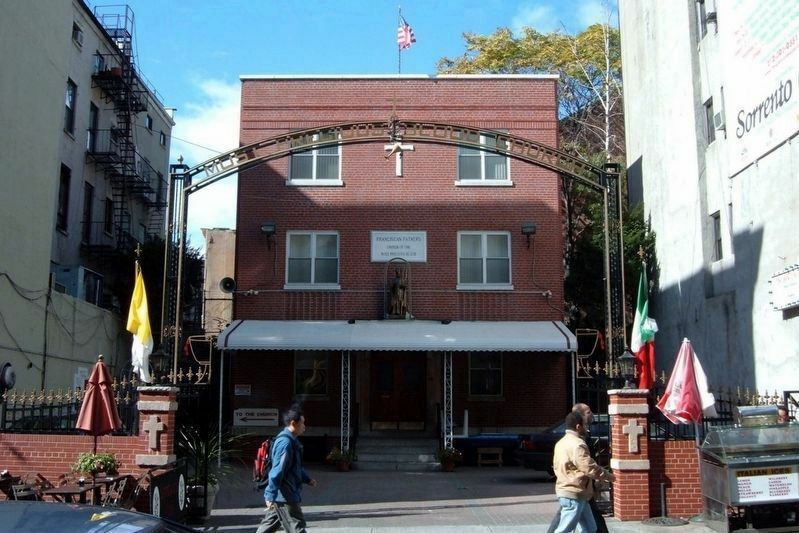 Marker is at or near this postal address: 109 Mulberry Street, New York NY 10013, United States of America. Touch for directions. Other nearby markers. At least 8 other markers are within walking distance of this marker. Most Precious Blood Church (here, next to this marker); Biography of Dr. Sun Yat-sen (about 800 feet away, measured in a direct line); Black Horse Inn (about 800 feet away); Renaissance-Inspired Bank for the Working Class (about 800 feet away); Engine Company 31 (approx. 0.2 miles away); George Washington Drank Here! (approx. 0.2 miles away); The Bowery Theatre (approx. 0.2 miles away); The Bowery Boys (approx. 0.2 miles away). Touch for a list and map of all markers in New York. More about this marker. 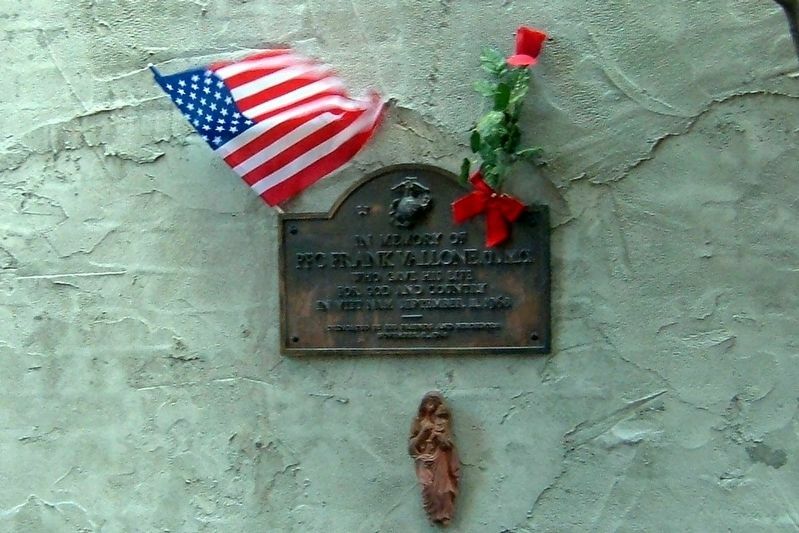 The marker is on the south wall of the courtyard of the Most Precious Blood Church's rectory courtyard. Another memorial to PFC Vallone is at St. James' Church, 32 James Street. The marker had previously been affixed to the front gate. The south wall is to the left. More. Search the internet for PFC Frank Vallone, USMC. Credits. This page was last revised on April 10, 2019. This page originally submitted on April 10, 2019, by Larry Gertner of New York, New York. This page has been viewed 37 times since then. Photos: 1, 2, 3. submitted on April 10, 2019, by Larry Gertner of New York, New York. • Andrew Ruppenstein was the editor who published this page.